After the big Thanksgiving dinner for the humans, we all weighed ourselves this morning. In Aurora’s case — and only in her case! — heavier is better. Today she was 4 pounds 6 ounces. That’s five ounces more than the last time we weighed her five days ago. Good girl! The pack stayed together and decompressed most of the day. By “decompress” I mean run, chase, chew, and snarl for an hour or so followed by complete collapse for several hours; repeat! 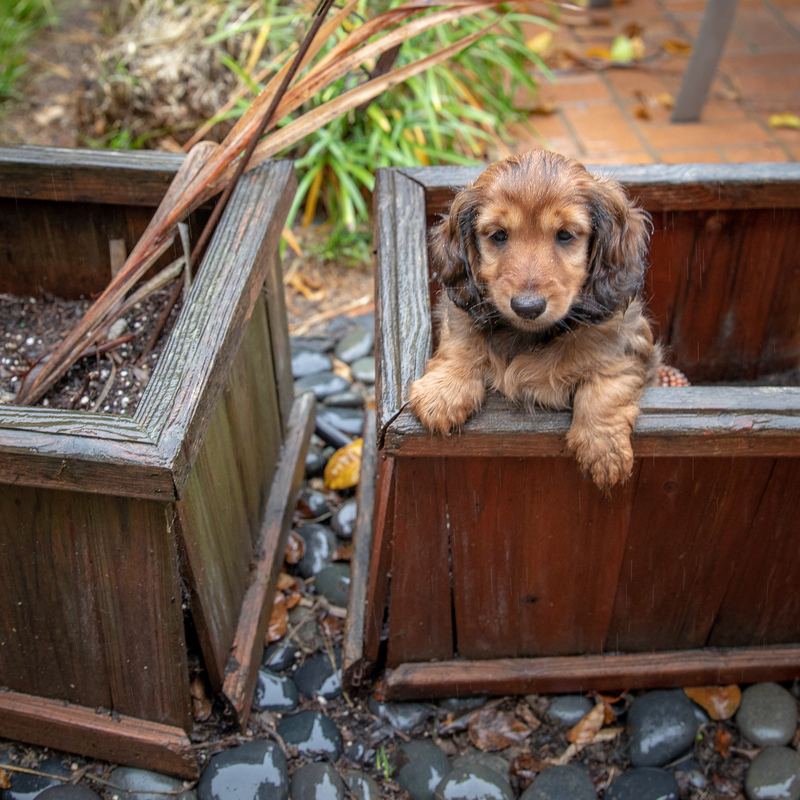 Aurora’s newest discovery is how to walk up the side of the decomposing planter box and join generations of dachshunds in staring at the world from its heights. Geoffrey did some work on his computer in the TV room. The pack happily joined him. Day 61 — Find the Hidden Dachshund How many dogs are on the bed? Look carefully at Zenith. Click on the picture (and any picture in the blog!) to see a larger version. In this case, even clicking may not help you count all pack members. Aurora is snuggled up to her mother’s underside! The long weekend let Aurora show off to more visitors. 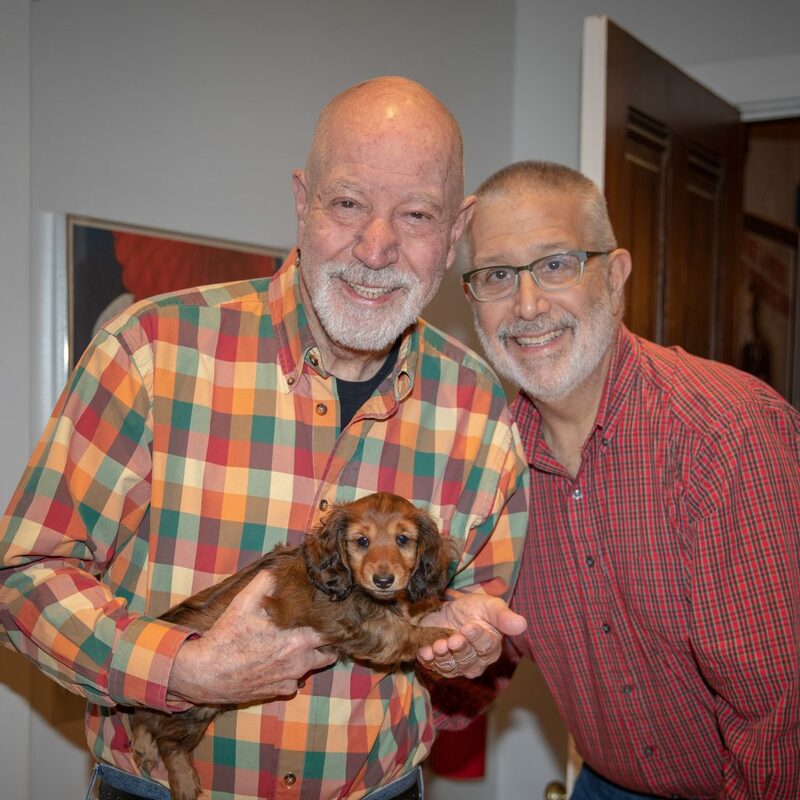 We were very happy to have our neighbors come over to see the puppy that the must have been hearing throw temper tantrums! Aurora showed off her ability to run and hold on to the ball at the same time. She also enjoyed being held and petted — adoration is always a good thing. Later Aurora met more friends for dinner. Ron and Richard were generous attention-givers, too. 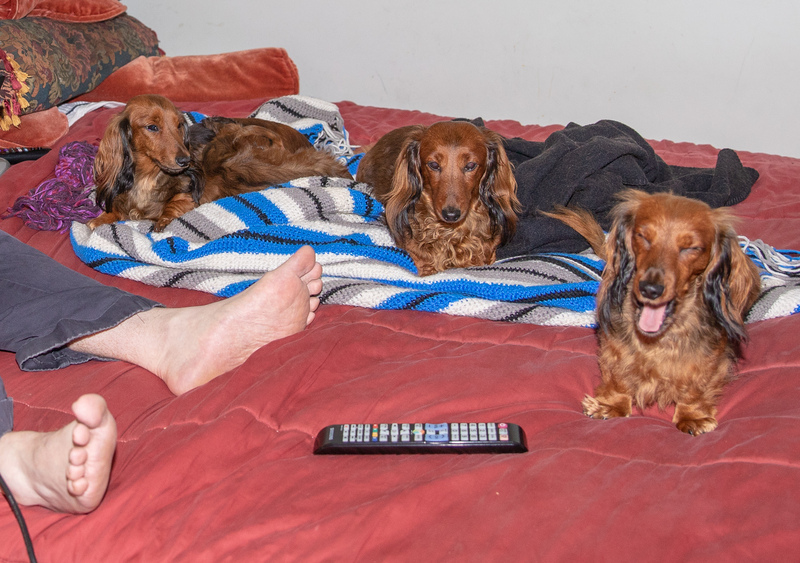 This entry was posted in dachshunds and tagged Aurora, Dachs in a box, dachshunds, Marjorie Scott, puppies 2018, Richard Leadbetter, Ron Goodman, socialization, visitors, zenith puppies. Bookmark the permalink.